Scores of Takfiri terrorists have been killed in few days of fighting in the battleground of Aleppo, as the Syrian army and its allies went ahead with its offensive against insurgents. SANA news agency reported that the Syrian army thwarted many infiltration attempts by terrorist groups south west Aleppo, killing scores of them, injuring others and destroying their ammunition. Syria’s Army Air Force carried out 20 sorties during which 100 strikes were directed against terrorists gatherings in Khan al-Asal, al-Mansoura, Mehrata, al-Zurba,Dahret Abed Rabu, Khan Touman, Uram al-Kubra in Aleppo countryside, SANA quoted a military source as saying. Meanwhile, Syrian and Russian army air forces targeted convoys of terrorists south west of Aleppo and destroyed three positions for them in Khan Touman, al-Zurbeh and Qabtan al-Jabal areas, according to the Syrian agency. 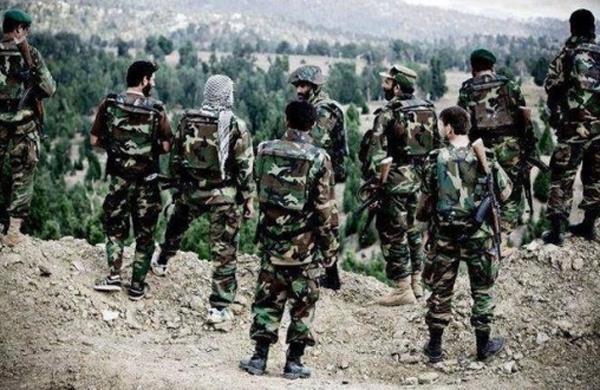 On the other hand, Lebanese resistance’s Military Media denied allegations by terrorist organizations that 23 Hezbollah fighters were captured by the insurgents, stressing that such news are aimed at diverting attention from the huge losses inflicted upon the Takfiris. Earlier on Wednesday, terrorists organizations acknowledged the death of 64 of their members, including some of their leaders. on Tuesday, they acknowledged that 56 others were also killed in Aleppo battles. TERRORIST CAMPAIGN TO LIFT SIEGE MISERABLE FAILURE. AMERICAN AND BRITISH IDIOTS EXPOSED FOR INCOMPETENCE. SAUDI LEADER ON DRUGS. Ba’ath Party sources now tell us that the 3rd wave of attacks by suicidal child molesting freaks in a plan called “THE GREAT BATTLE” has failed opprobriously. It has exposed the public lying practiced by John Kerry while his team of Keystone Cops in Turkey collude with the limey MI6 trash to give the world one Waterloo after another. On August 1, 2016, the Syrian Army General Staff sounded a general alarm after receiving very accurate reports that the rodents, principally those affiliated with the Saudi child fetishist, ‘Abdullah Al-Muhaysini, were planning a huge offensive to break the siege of Aleppo which left thousands of cannibals inside the eastern part of this great northern capital adrift and without hope of succor or supply. Syrian Intelligence eavesdropped on hundreds of contacts from Turkey, primarily, Incirlik, Reyhanli, Adana and Gaziantep with British, American and Saudi imbeciles trying to organize the logistics for the operation. This is most interesting because it puts the Americans squarely on the side of Alqaeda, the same group which took down the twin towers in NYC. The general alarm concerned clear data targeting the Raamoosa Axis with a simultaneous attack on the Al-Hikma School. The attack would start with an assault on a Syrian Army outpost at the school which would ostensibly permit the rodents to penetrate army lines up to a maximum of 20 kms. The rodents started their assault with the usual “Sturm und Drang”, a patented, and boring use of crazed poverty-stricken retardates from Central Asia promised an eternity of bliss with the usual tarts imagined by feckless bedouins moving inexorably from one desolate corner of the Arabian desert to another. The suicides were followed almost instantly by an explosion of a tunnel near the Sadcop Factory. The synchronization reminded me of the Ed Sullivan Show of the 60s when great circus acts would perform miraculously on the stage to the oohs and aahs of American matrons slugging down Imperial Whiskey. The suicide attackers were all incinerated before they could reach their destinations and the tunnel explosion was a fiasco as it managed to only kill a few rodents who reportedly had to correct some malfunction in the detonation mechanism resulting in an earlier than expected BOOM! So sad, really. The initial attacks were not long-lived. As soon as the dust settled from the tunnel disaster, a big battle ensued with the SAA using an ancient technique invented by the great Canaanite/Punic general, Hannibal, at the battle of Canae where whole legions of Roman troops were suckered into a veritable pocket of annihilation almost bringing down the entire Roman state. The SAA is very well equipped, as the rodents found out, and thousands of field artillery rockets, missiles rained down on the scurrying vermin. My source tells me that there was an expectation of over 70 dead rodents in this battle. But, as it turned out, hundreds were killed and injured, many screaming why the Great Satan, in whom they believe, had abandoned them. One of the hilarious sidelines to this story was the degradation to which the meretricious Arabian Qatari “news” outlet “Al-Jazeera” was exposed when it reported that the rodents had conquered Al-Raamoosa. All of my readers know from our reporting that no such event could have taken place. At Al-Raamoosa, Jaysh Al-Fath attacked on 3 lines: Al-Manaashir, the Cardboard Factory and Al-Huwayz Hill. They were stopped, literally, dead in their tracks by both the SAAF and RuAF flying continuous sorties and dropping all kinds of exotic bombs on the chaotic hordes trying to escape the conflagration. The attack was carried out by Jaysh Al-Fath in combination with America’s favorite love-secret: Alqaeda (Nusra), Ahraar Al-Shaam, Kataa`ib Fath Al-Shaam, Kataa`ib Abu-‘Ammaara, all emerging from the edges of Al-‘Aamiriyya Quarter, the Sadcop Area and the environs around Al-Raamoosa. Once the suicide truck drivers were sent straight to the fires of Hell, and the tunnel had been detonated harmlessly, a very violent battle took place with the carcasses of terrorist rodents flying in the air in a surreal chiarascourial scene with a burning backdrop of raging flames as their vehicles succumbed to the pressures of carrying too much petrol on their tanks. The poor rodents found they could not advance anywhere. When the SAA found there were no more targets to kill, they began to fire at buildings in the abandonded Project 1070 where many rodents hid to avoid the flames of this temporal world. While all this hurly-burly was unfolding, another attack was taking place with Jaysh Al-Fath, Harakat Nooreddeen Al-Zangi, Faylaq Al-Shaam, Nusra/Alqaeda and some groups populated by Turkmen and Uighers, leading the charge. This attack concentrated on the Cardboard Factory and the Manaashir Minyaan. Once again, our field commanders, like those in West Point, studied and implemented Hannibal’s immortal tactics by withdrawing in the shape of an open circle, allowing the rodents to charge in screaming like a swarm of banshees, and then surprising them with the unfortunate truth that they were surrounded and about to be decimated. Hundreds of rats were killed. The SAA destroyed 16 pickups with 23mm cannons, 1 tank and 2 BMPs. The SAAF helicopter attack gunships were extraordinarily useful here and they went through the rodent lines like a ship’s propeller. Today, in the early hours, the rats had only managed to advance at the Al-Huwayz Hill. But, that was meaningless from the tactical standpoint. It affected, in no wise, the fact that the remnant rodents inside Aleppo were being exterminated. In any case, the SAA has liberated the hill and killed 22 rodents in doing so. The tactics of the rodents here was to play cat-and-mouse. SAA used fixed mortar and artillery rockets to keep the rodents off-balance as militiamen deployed all over the hill picked the rodents off like ducks in a Coney Island shooting gallery. As of my writing, the SAA has taken back Al-‘Aamiriyya and Tallat Al-Mahrooqaat (Fuel Depot Hill). The SAA has also just liberated Al-Saabiqiyya to the south after a major counter-offensive. Much has been promoted by the terrorists supporters about this long-planned and obvious campaign in Aleppo. This project was planned by the very same countries promoting, funding and enabling terrorism in Syria and in most of the world. The background of obsession with terrorism is explained below. The terrorist-supporting countries, momentarily giving up on southern Syria and the Damascus front in order to concentrate on the plan to take control all of northern Syria. The terrorists’ counter-offensive in Latakia during July to draw Syrian troops away from Aleppo. The fact is that this was planned a long time ago; and it was a resourceful and timely-executed campaign….not just to break the siege of Aleppo, which became its slogan due to the fact the terrorists themselves were encircled a week earlier, but in fact, the terrorists and the CENTCOM headquarters had decided to cut off Aleppo and all the northern Syrian provinces from Syria, meaning this campaign aimed to wrest Aleppo Province from Syria by cutting all the supply routes toward the city and northern Aleppo, as it was done in Idlib during 2015. This may seem a bold statement: but, take a look at what happened on the northern border of Syria to see that much was accomplished in advancing this plan and, generally, only Aleppo City and closer towns stood in the way of this plan. in the life of my fatigued retinas. The swift Aleppo siege campaign in Al- Mallaah Farms and Al-Khaalidiyya, with the unanticipated results of the ‘checkmate’ in Bani Zayd and Ashrafiyya forced an humiliating and accelerated defeat that brought to a stop the murderous shelling that terrorized civilians in downtown Aleppo, besides the freeing up of thousands of soldiers to fight in other fronts. The Tabqa/Raqqa “controversy” campaign that brought some relief toward Khanaassir Road at last, coupled with the SDF campaign toward Manbij that shifted ISIS attention toward that direction versus Aleppo city. The “coup” in Turkey that disrupted the easy flow of terrorists and weapons, momentarily, created a risky situation for the terrorists in Syria when they saw a possible long-term reduction in support and attention from their former northern ally and enabler, Erdoghan. This is day 4 of the terrorist offensive to break the siege of Aleppo. It is safe to say that it has lost its strength as the implementation of its plan has been extremely erratic in the past day or two. The initial results were somewhat encouraging for the terrorists and their CENTCOM masters. It mostly came in the wake of a concentrated attack within a limited front line of some 10-15 kms where the terrorists threw everything they had, VBEIDs, TOWs, armoured vehicles, individual suicide attackers, mortars, all very concentrated just to open up a route to eastern Aleppo and to relieve the remaining rodents inside the city. There was some coordination with ISIS since the latter launched a VBEID at a check point in Khanaassir, that was destroyed before reaching its target. The plan was most likely designed to draw SAA troops toward that location. Since that time, there has been no ISIS attack after that. The Khanaassir Road has never been closed and traffic moves normally. The moment of greatest risk came between day 1 and 2, during phase 1 and 2, when the terrorists managed to secure the 1070 Building Project Complex while, at the same time, they moved further south to the village and hill of Al-Huwayz and the vital village of Al-Mushrifah and surrounding hills, which gave them a strong artillery firing position to shell the Al–Ramoosa artillery base and industrial complex. At this point in time, the the terrorists were very close to their objective in creating a route and disrupting the road inside Al-Ramoosa that supplies Aleppo. Right after that moment, the terrorists launched phase 3 which consisted of creating a diversion from Al-Sukkari Quarter inside besieged eastern Aleppo, in order to link up with the advancing terrorists from western Aleppo. While phase 1,2 and 3 were unfolding, the Syrian forces and allies were executing their counter- offensives, mainly based on holding the ground in the Al-Raamoosa artillery base and industrial sector, while attempting to flank the terrorists from north and south, meaning taking back the 1070 apartment complex and south of it to retake Al-‘Aamiriyya, Al-‘Amaara and Al-Huwayz villages and hills. While partially successfully so far, (See Ziad’s report herein-above) the counter offensive has blunted the main thrust of the terrorist attacks, which when coupled with a relentless bombing campaign by RuAF and SAAF, both in the front lines and in the logistic supply lines toward the Turkish border, vaporized American dreams of a continuing war to destroy Syria. The key battle now is for the village of Al–Mushrifa. Losing it will mean a complete collapse of the terrorists’ offensive and, most likely, a total terrorist retreat to either the original front lines or even losing more ground to the Syrian forces. The next day or so will decide this battle. Too much resources and planning were invested in this offensive. The risk is very high for the terrorists and their supporters. Right now, the way it is unfolding will lead to massive failure. This failure will most likely weaken the terrorists in western and northwestern Aleppo and create a scenario replete with chaos and gnashing of teeth. At the end, this may have being their “bridge too far” operation. معركة «فك الطوق» عن حلب: لم يمرّوا!